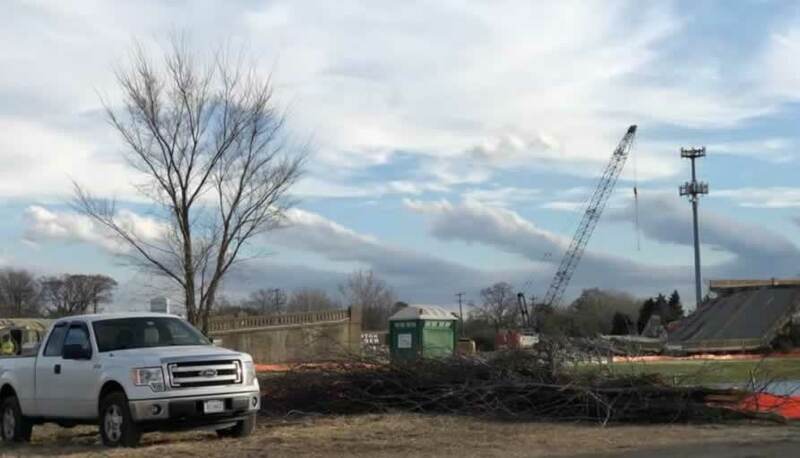 FEB. 9, 2019 – As activity in this area continues to increase, signs of progress have slowed since the first span was felled a few weeks ago. Though no more of the bridge has come down, there seem to be increasingly more workers and vehicles in the project area. 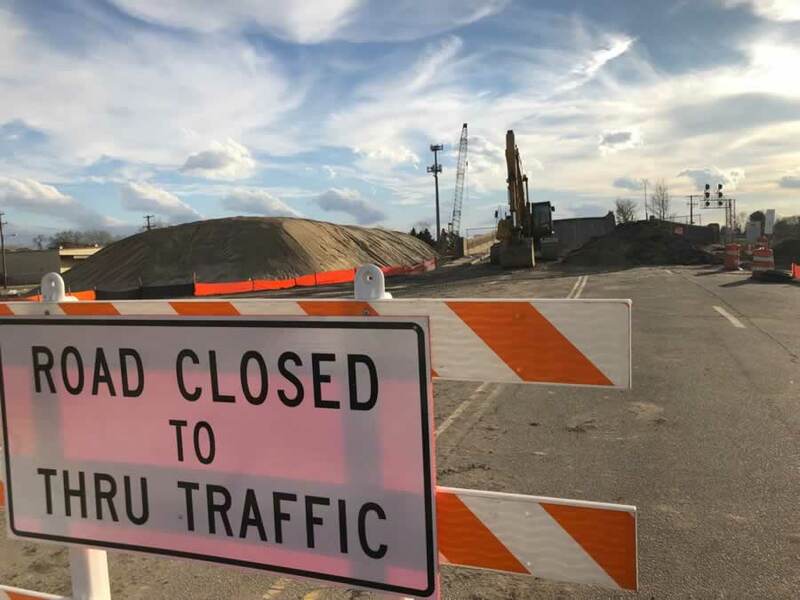 Because this bridge covers several active railroad tracks, construction and railroad companies must work together to manage the demo that remains. 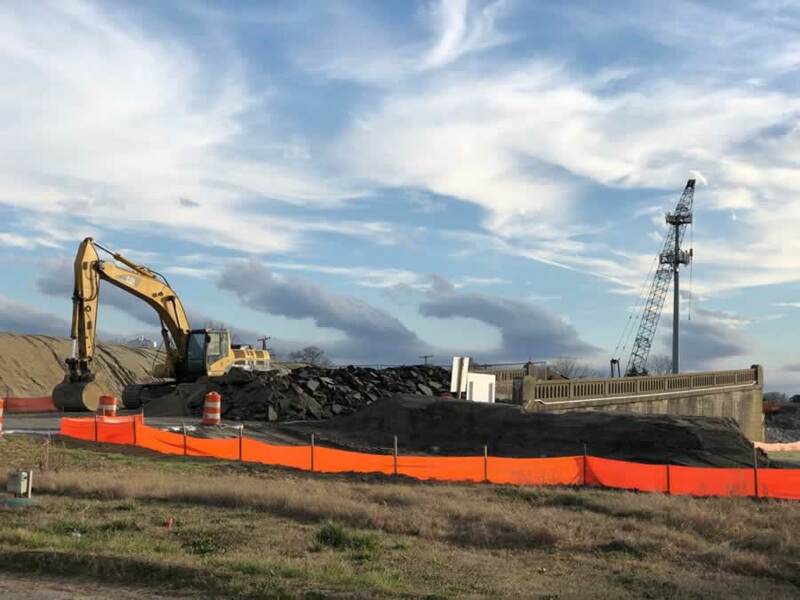 Construction is expected to be completed in May 2020, according to Eric Martin, PE, Public Works Department, City of Chesapeake. 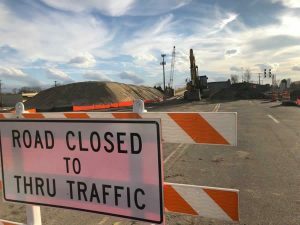 Local leaders are asking residents to remember the end result: A smoother passage to and through South Norfolk. 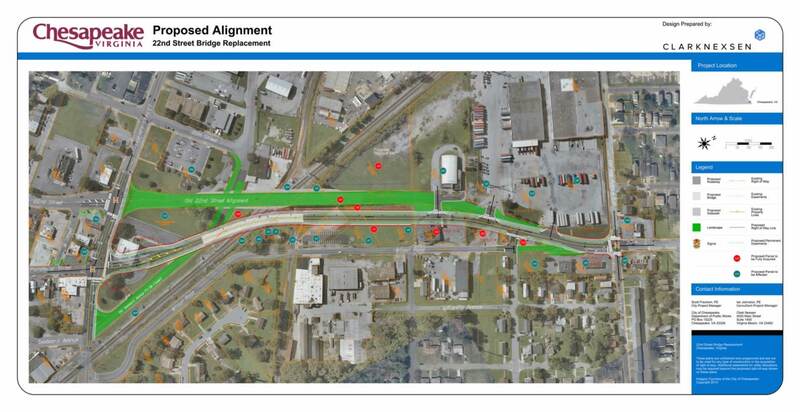 Below is a map of the new alignment of the new bridge. Click to enlarge map to see detail. For greater detail, CLICK HERE to download and view map PDF from the city. For those routinely stranded by trains, HistoricSouthNorfolk.com has produced maps to help people get around the trains when necessary. It has been a bit of a mess in Portlock for what seems like a month of Sundays, but the project has maintained steady progress and is nearing completion. 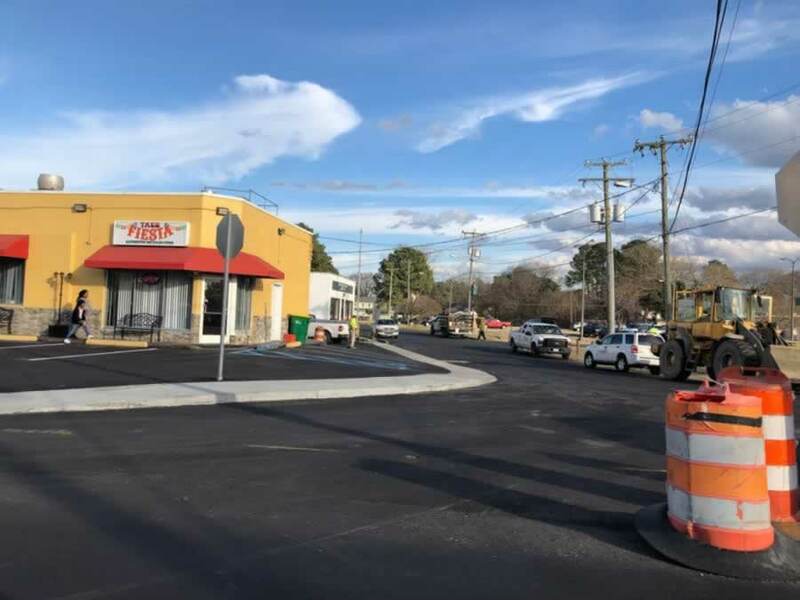 The road and curbs look nice, and we are looking forward to street striping, landscaping and lighting to complete the look. Click to enlarge. The old Jenning’s Home at the northwest corner of Chesapeake and Holly in South Norfolk, and its new house next door. 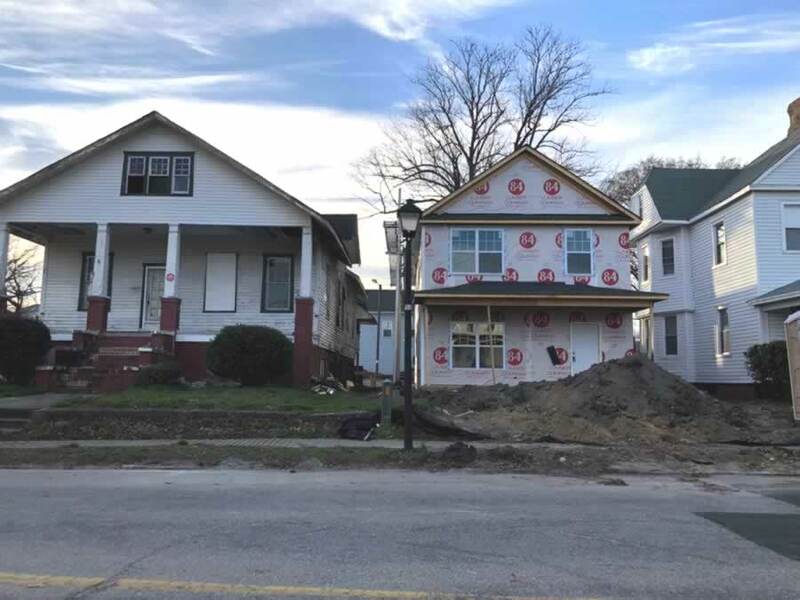 It’s going to take some “getting used-to,” this new home (designed to look old) which has been built between the old Dr. Jenning’s Home and Office at Chesapeake and Holly, and the large old home that was once next door. Down Bainbridge, near the Reunion condo community, we were happy to see that the large building with store fronts on Bainbridge is finally getting a face! Reunion is a townhome styled condo community offering 3-story floor plans with 2 to 3 bedrooms, 2 to 2.5 baths, and between 1,400 to over 2,000 sq. ft. of living area. There is a monthly HOA fee of about $165, and homes list for about $300k. 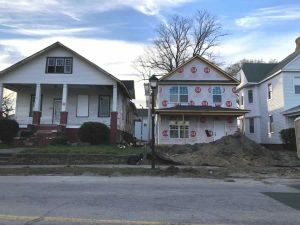 The city organized a private, by-invitation-only meeting in late January that brought people together to discuss the revitalization of South Norfolk. If there is enough interest, the meetings will continue. Some in the South Norfolk community said they would have liked to have known about the event. 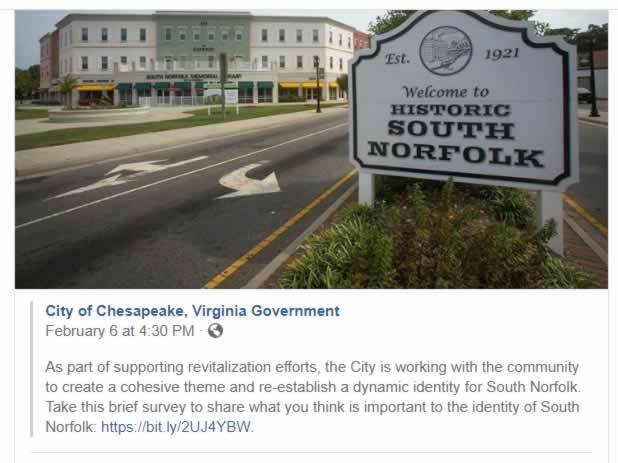 The City of Chesapeake shared an online survey on Facebook targeted to South Norfolkians and those who are interested in the area. 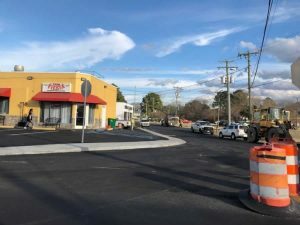 Among the city’s list of projects in South Norfolk is the “Poindexter Street Sidewalk to Elizabeth River Park” project, currently in design. 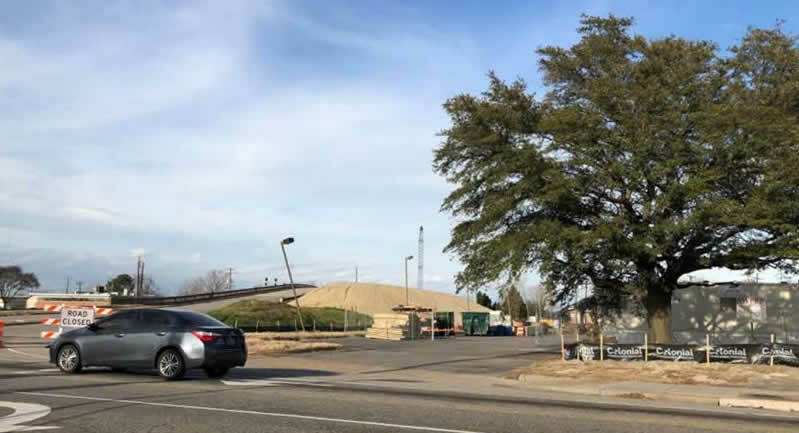 The project will provide a 5-foot sidewalk from Bainbridge Boulevard to Elizabeth River Park at South Norfolk Jordan Bridge along the south side of the I-464 overpass at Poindexter Street. 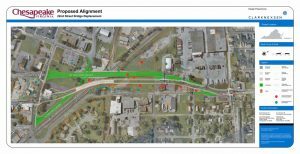 Nearly $550 thousand has been budgeted for the sidewalk. 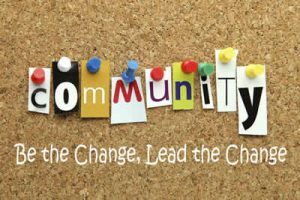 The South Norfolk Civic League meets at 7 p.m., 2nd Mondays of the month at the South Norfolk Community Center, 1217 Godwin Ave. in Portlock. The Fourth of July Parade and Picnic folks are in the early stages of organization. You can contact them by email at southnorfolkcivicleague@gmail.com. The South Norfolk Neighborhood Watch meets 3rd Mondays of the month at 7 p.m. in the Community Room at the South Norfolk Library. The Chesapeake Historic and Architectural Review Board meets first Thursdays at 5:30 p.m. The Portlock, 3815 Bainbridge Blvd. 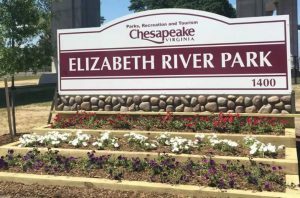 The Chesapeake City Commission meets 2nd, 3rd, 4th Tuesdays at 6:30 p.m. at City Hall. AUTHORITY PEST CONTROL is LISTED! Owned and managed by Charles Brockley of South Norfolk, Authority Pest Control is your South Norfolk source for pest control. Give Charles a call and get your pest situations managed in time for the arrival of spring! Visit Authority Pest Control’s website, HERE. 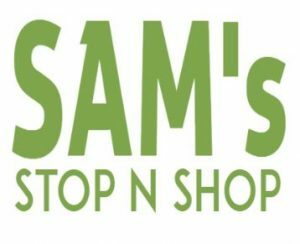 SAM’S STOP N SHOP is LISTED! 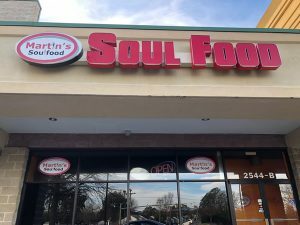 The Martin’s Soul Food restaurant in the Bainbridge Marketplace at 2544 Bainbridge Blvd. has closed. To find listings of businesses in South Norfolk, search the South Norfolk Business Directory! Did you read the Jan. 2019 BizBlog? Free listings are available to all South Norfolk businesses and entrepreneurs in the South Norfolk Business Directory. Did you know the directory is optimized for use on mobile, including interactive maps that lead buyers right to you? If you need help creating your listing, contact us! Subscribe to the South Norfolk Biz Blog! It's FREE!